SINGAPORE, June 14, 2018 - (Media OutReach) - With more than 35 of the world's media outlets live-streaming on Twitter as a sitting US President and a North Korean leader met for the first time in history, and nearly 4 million Tweets shared from 1 June when the Summit was confirmed to 13 June the day after the event, the world watched and talked about the #TrumpKimSummit on Twitter. From political leaders to journalists, experts to citizens across the world, Twitter was the only platform where you could see every side of the #USNorthKoreaSummit and to talk about the event - to get a wide range of perspectives, to get a more informed point of view, and to engage with content and conversations at the same time. 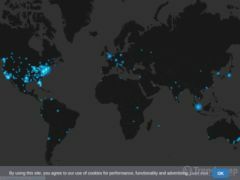 Below is a global heatmap showing the live Twitter reaction on the day of the #TrumpKimSummit on 12 June. Tic Toc by Bloomberg, hosted its first ever live Blue Room stream on Twitter which featured Bloomberg's Korea reporter Jihye Lee (@TheJihyeLee), Chief Washington Correspondent Kevin Cirilli (@kevcirilli) and Bloomberg TV anchor Yvonne Man (@YvonneManTV), and answered questions posed on Twitter using the hashtag #TalkTrumpKim. South Korean broadcaster ArirangTV, in partnership with the Korea Press Foundation, also hosted a live Blue Room moderated by Anna Fifield (@annafifield), Washington Post's Tokyo-Seoul bureau chief, and she will be joined by a panel of Korean political experts: Kim Joonhyung, a professor at Handong Global University of Korea; Kim Jiyoon, a research fellow at the Asian Institute for Policy Studies; John Delury (@JohnDelury), an associate professor from Yonsei University, and Shawn Ho, an associate research fellow from Nanyang Technological University. News partners around the world also created Moments to tell the story of the Summit and how the conversation and commentary unfolded. From experts live-Tweeting their analysis and observations, to people on the Korean Peninsular joining the conversation, Twitter again demonstrated that it is one of the the best ways to see what's happening and to talk about it. Now, with a joint statement signed by the two leaders and the world waiting to see what happens next, Twitter will be the place to continue the conversation and keep track as news breaks on the Korean Peninsular or anywhere in the world.